Occurrence: Oats are used to make porridge and a wide variety of cakes and biscuits. Oats are also found in muesli or granola. Beer can be made from oats. More information..
Järvinen et al. (2003)  reported on 90 paediatric milk allergic patients who had residual symptoms after elimination of milk. 33 were challenged with oats (open) and 1 showed immediate symptoms (urticaria) while 24 showed delayed symptoms (16 eczematous rash, 6 diarrhoea, 1 eczematous rash and diarrhoea and 1 fever). Reactions that occurred within an hour from the last dose were defined as immediate. Varjonen et al. (1995)  reported on paediatric patients who had atopic dermatitis and a range of other symptoms on challenge with wheat, rye, barley and oats: asthma, urticaria, erythema, pruritus and allergic rhinitis. Varjonen et al. (1994)  reported on adult patients, 35 with severe chronic atopic dermatitis, 4 with urticaria and 1 with rhinitis on challenge with wheat, rye, barley and oats. Food/Type of allergen:Flour extracted with saline, 200 mg/0.3 ml. (Rasanen et al. 1994 ). 33/90 children, aged 2.5 to 36 months, with residual symptoms after cow's milk elimination were tested with oats (Järvinen et al 2003 ). 34 paediatric patients were studied who had atopic dermatitis and a range of other symptoms (Varjonen et al. 1995 ). 145/360 patients from 3 months to 30 years, median 4.5 years gave a positive SPT to any cereal. 127 patients were tested with oats (Jones et al. 1995 ). 6/33 children gave a positive SPT with oats, who were all positive on open challenge (Järvinen et al 2003 ). 18/34 patients had a positive SPT reaction with oats (Varjonen et al. 1995 ). Food/Type of allergen:Commercial extracts were used for RAST. Flour was extracted with potassium phosphate at pH 7.0 containing 400 mM NaCl or with 50 mM sodium acetate pH 3.8 for immunoblots. 34 paediatric patients were studied who had atopic dermatitis and a range of other symptoms: asthma, urticaria, erythema, pruritus and allergic rhinitis on challenge with oats (Varjonen et al. 1995 ). Sera from 15/145 patients of whom 9/15 were challenge positive to a cereal were studied (Jones et al. 1995 ). Sera from 40 adults, 35 with atopic dermatitis, 1 rhinitis and 4 urticaria (Varjonen et al., 1994 ). Sera from 3 children with atopic dermatitis (Rasenen et al, 1994 ). RAST showed 1.4, 8.0, 16.0, 28.0 and 71.0 kU/L of IgE to oats in the 5 challenge positive patients. The other 29 had 0.5-17.0 kU/L of IgE to oats (Varjonen et al. 1995 ). Oat specific RAST was determined for 40 patients; 3 had class 4, 7 class 3, 14 class 2 and 11 class 1 RAST results. 5 had class zero (i.e. no significant specific IgE binding). 33 patients gave IgE-positive immunoblots with oat proteins (Varjonen et al. 1994 ). 1/3 children with atopic dermatitis gave a positive RAST to oats 13.5 kU/l and also reacted to challenge (Rasenen et al, 1994 ). Jones et al. (1995)  used 1D SDS-PAGE with a 3% stacking gel and 13.5% separating gel with samples reduced with dithiothreitol. Jones et al. (1995)  used nitrocellulose membranes and washed with Tween-containing solutions. Varjonen et al. (1994)  electrotransferred proteins onto 0.2µm nitrocellulose membranes which were cut into strips and incubated overnight with sera (1:4 dilution) in saline with 0.5% (v/v) Tween. Detection used 125I labelled anti-human IgE. Variable immunoblotting patterns were obtained; 67% of sera reacted with a 46 kDa band, 53% with a 66 kDa band, 35% with a 30 kDa band. Major allergen bands were 46 and 66 kDa. IgE from sera also reacted with proteins from wheat, rye and barley (Varjonen et al. 1995 ). Immunoblotting showed extensive IgE binding to proteins of wheat, rye, barley and oats, which was not always clinically relevant (Jones et al. 1995 ). The 66 kDa protein was most frequently recognised by IgE from 28/33 sera (84%). Proteins detected as intermediate allergens (10%-50%) ran at 23 kDa and 42 kDa. 7 minor allergens were also identified(Varjonen et al. 1994 ). Food used and oral provocation vehicle:After an initial drop tested on the lips, oral doses were 1, 5, and 10g of cereal as porridge cooked in water at 0.5h intervals on day 1 followed by normal eating of cereal on day 2 (Järvinen et al. 2003 ). Varjonen et al. 1995  used the above doses but at a slower rate of two doses per day up to 2 doses of 10 g. They tested initially on wrist and upper lip. 10% cereal cooked in water. Oral doses were 1, 2, 5, 10, 20, 50, 100mls at 1h intervals. Blind challenges were concealed in buckwheat (Rasenen et al. 1994 ). Open Varjonen et al. (1995) . 33 children (Järvinen et al 2003 ). 34 children (Varjonen et al. 1995 ). 29 children (Jones et al. 1995 ). 3/39 atopic children (Rasenen et al, 1994 ). 25/33 children showed symptoms on open challenge with oats (Järvinen et al 2003 ). One immediate with urticaria and 24 delayed with 16 eczematous rash, 6 diarrhoea, 1 rash and diarrhoea and 1 fever. Reactions that occurred within an hour from the last dose were defined as immediate. 5/34 patients gave a positive reaction on challenge with oats. One developed wheals at the skin contact site and 4 delayed reactions of erythema and pruritus (Varjonen et al. 1995 ). Reactions that occurred within 2 hours from the last dose were defined as immediate. 5/29 patients gave a positive reaction on challenge with oats (Jones et al. 1995 ). 1/3 children with atopic dermatitis gave an immediate reaction to oats (none gave delayed reactions) (Rasenen et al, 1994 ). Serum IgE binding to several cereals may be observed but may not always have clinical significance (Jones et al. 1995 ). Barley, wheat and rye are closely related cereals, all being members of the Triticeae, and have seed stirage prolamins as the major seed protein constituent. Oats are more distantly related and contain a lower proportion of storage prolamins which are structurally distinct from those of the Triticeae. 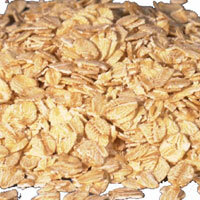 Oats contain two types of storage proteins; 12S globulins and prolamin avenins. The latter are distantly related to seed storage proteins of the Triticeae (Shewry 1999 ). Palosuo et al (2001)  identified IgE cross-reactive proteins in wheat, barley and rye but not in oats. Immediate and delayed reactions on challenge are discussed in the wheat entry. Food protein-induced enterocolitis syndrome may also involve oats (Nowak-Wegrzyn et al. 2003 ). Avenins: The Prolamins of Oats. Process, chemical, enzymatic:The stability cereal allergens from wheat, rye, barley and oat was studied by Varjonen et al. (1996)  who found that no processing condition entirely abolished IgE binding. Nature of main cross-reacting proteins:In the study of Varjonen et al. (1994)  oat allergic sera cross-reacted with proteins from wheat, rye and barley. Allergen properties & biological function:The major storage proteins of oats are not prolamins, the avenins, but globulins. The avenins are a highly polymorphic group with Mr 20-30,000 and a minor group Mr 30-40,000. The oat globulins consist of 12S species, with Mr 330,000 comprising six subunits of about Mr 55,000 comprising Mr 33,000 and Mr 23,000 chains linked by S-S bonds. It is likely that these are involved as allergens in oats. Allergen purification:The purification (and properties) of oat avenins is reviewed by Shewry, 1999  and that of the 12S globulins by Shotwell, 1999 . Other biochemical information:Allergens have been identified by immunoblotting and gave variable IgE-binding patterns (Varjonen et al. 1994 , 1995 ). Thus in children (Varjonen et al. 1994 ) 67% of sera reacted with a 46 kDa band, 53% with a 66 kDa band, 35% with a 30 kDa band. Major allergen bands were 46 and 66 kDa. In adults (Varjonen et al. 1995 ) the most frequently recognised polypeptide was a 66 kDa protein, with 23 and 42 kDa proteins being recognised at a lower frequency.